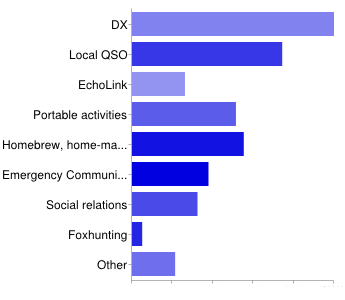 Likes: What most like to EURAO members and supporters is: DX (25%), local QSO (18%), home-made (14%), portable activities (13%), emergency communications (9%), social relations (8%), EchoLink (6%), foxhunting (1%) and others (5%). Time: 62% of them spend on radio "every day a while" (or maybe they wanted to say "I would like to spend"... hi hi). 15% "once a week", 11% "every weekend", 5% "once a month", 3% "only on holidays" and a 4% confesses being not active. Age and experience: The average participant was 54 years old and has been involved in amateur radio for 29 years. There is a gap in the statistics because those leaving the hobby before 5 years. Dreams: Recovering values as: friendship and ham spirit, experimentation and innovation; organizing activities as: contests, parties, awards, exercises, workshops; improve existing services and create a new ones; cooperation with other organizations; getting recognition at European and international level; and more promotion, inside and outside ham radio, about our hobby but mainly about ourselves in order to have more members. Summarizing: a lot of ideas to work and little money, so we will have to sharpen our wits and carefully prioritize efforts trying to build this borderless community called EURAO. We started in September 2012 with this very simple means of communication: just a sheet of paper, both sides, sent quarterly to our members, friends and supporters. EURAO Newsletter is in two (really three) formats: web and pdf, which is printed and sent by mail to individual members and clubs&groups. The others are informed by email when every issue comes out. Thanks for the attention and news. Centro Italiano di Sperimentazione ed Attività Radiantistiche will hold its Assembly and Meeting on 28-29 September in Fano (PU). As usual, the event will be broadcast live on its TV channel: Meeting on Saturday afternoon and Assembly on Sunday morning. Good chance to practice Italian. On October 4-6, convoked by European Radio Sport Federation and organized by Lithuanian Radio Sports Federation, this event will take place in beautifully arranged landscape reserve of Bir¨tonas/Prienai, 40 km south from Kaunas (Lithuania). All sportmen of any country, city, sport organization, etc., are invited to participate. Contact details: kregzde.algis@gmail.com; +37037300779; LRSF, P.O.Box 210, Kaunas LT-44003, Lithuania. In occassion of its 15th anniversary, Vlaamse RadioAmateurs, ON4VRA, our member association in Flanders (Belgium), will hold this contest on Saturday October 19 (from 17:00 to 19:00 UTC) in the following bands: 80m, 2m and 70cm; and in all modes. Although the contest has, of course, a real classification, the main goal of the event is to promote activity and fun among radio amateurs. Tertúlia Radioamadorística Guglielmo Marconi, CS5TRGM, held the 19th edition of this event on Sunday November 3. 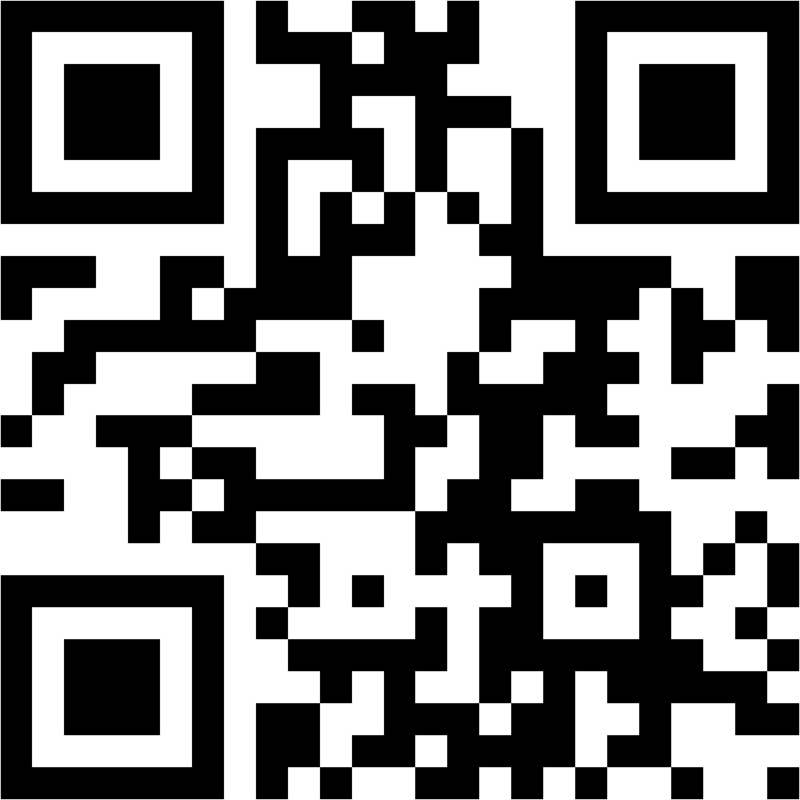 There you can purchase, sale or exchange with other OMs/YLs or shops. But the most important is meeting and socializing with people coming from all over Portugal even Spain. Come with your family and visit the beautiful city of Coimbra. We await you! 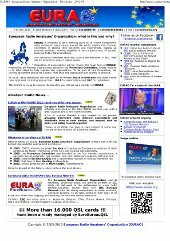 EURAO Newsletter, quarterly and in two formats: pdf and web.